An unmissable event is to take place on Saturday the 14th April!! Years of planning and months of preparation have gone into this ‘once in a 100’ year event. Please come along, share this post and tell everyone you know. 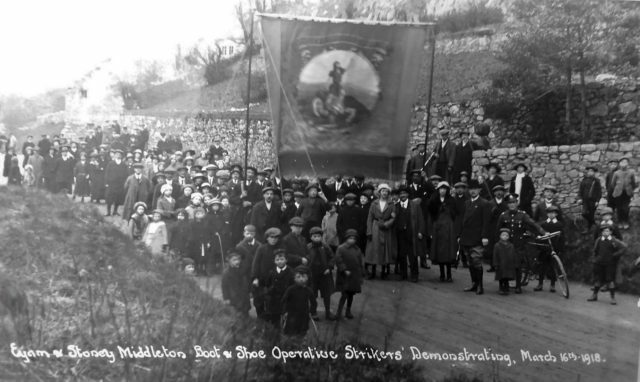 100 years ago, Stoney Middleton and Eyam made history when the boot and shoemakers (a major industry at the time) took part in one of the longest strikes known. 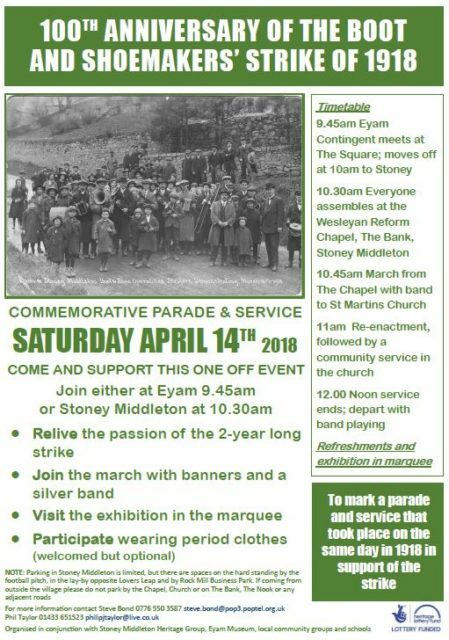 A commemoration parade commences at 9.45 am from Eyam to Stoney Middleton, accompanied by a marching band with banners, culminating in the Nook at 11.00 am, with a re-enactment giving an insight into the dire conditions of the time. The band will continue to play in the church, along with a recreation of events with readings from important persons of the time (see timetable below). The activities will be streamed live into marquees in the church gardens. The marquees will also house a comprehensive exhibition of the strike. Additionally, there will be the first preview of the long awaited, professionally made Stoney Middleton village film, featuring various local residents (see preview clip below). The event will be providing refreshments throughout, in the form of excellent homemade cakes, beverages and the not to be missed Maxine’s artisan handcrafted, wood-fired pizzas. Get into the spirt of the occasion by wearing something old (world war one period)! Proceeds raised will be donated to Helen’s Trust. ….. a very interesting morning at Stoney Middleton …. the children were awesome in the re-enactments etc., and a credit to their parents and teachers…. it served as a reminder to me of the privilege of growing up in a derbyshire village one which I share. The event was supported by the trade union movement and the event highlighted the important historical role of the trade unions. I had ancestors on both sides of the dispute and was touched by the reading of my great grandfather’s diaries asking for the release of my grandfather from service at the end of the war to help him run the factory. Very well done to the villages of eyam and stoney for putting on such a wonderful event.